The Five Star Down Alternative Pillow has a crisp cotton outer cover and filled with hypoallergenic polyester filling. It falls lower on the firmness and support scale, which may make it a better fit for stomach sleepers than others. One of the best features? How simple it is to care for. Read on for my full review. 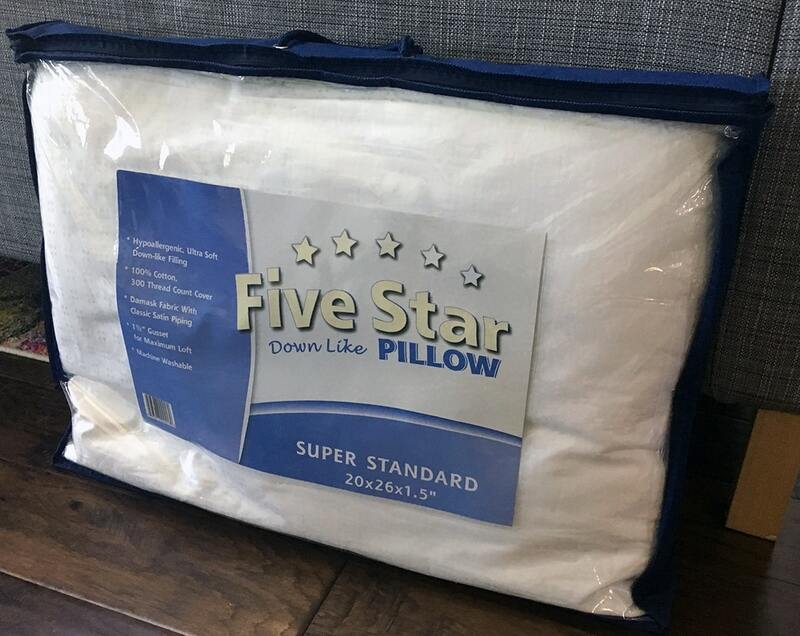 The Five Star Down Alternative Pillow is part of the Five Star Pillow Collection made by a company called Mastertex, Inc.
Mastertex focuses on the design, manufacture, and sale of bedding products like duvets, sheets, mattress pads, pillows and more. The company actually operates five separate bedding brands, including Five Star. The pillow is made my Mastertex but the pillow I received was sold on Amazon by a company called Right Choice Bedding (and fulfilled by Amazon). Five Star’s Down Alternative Pillow is fairly simple in its construction. It comes fully expanded in a traditional pillow shape. The outside is a soft 100% cotton damask fabric cover (non-removable). The fabric is white and it has a light design printed on it. Inside the pillow are polyester fibers. This is designed to give you the feel of soft down, but it won’t separate and you can’t bunch the pillow together like you could with a down pillow. You cannot remove the outer cover or any of the filling inside the pillow. However, you can either have it professionally cleaned or wash and dry it yourself. I found this down alternative pillow to be simple and comfortable. 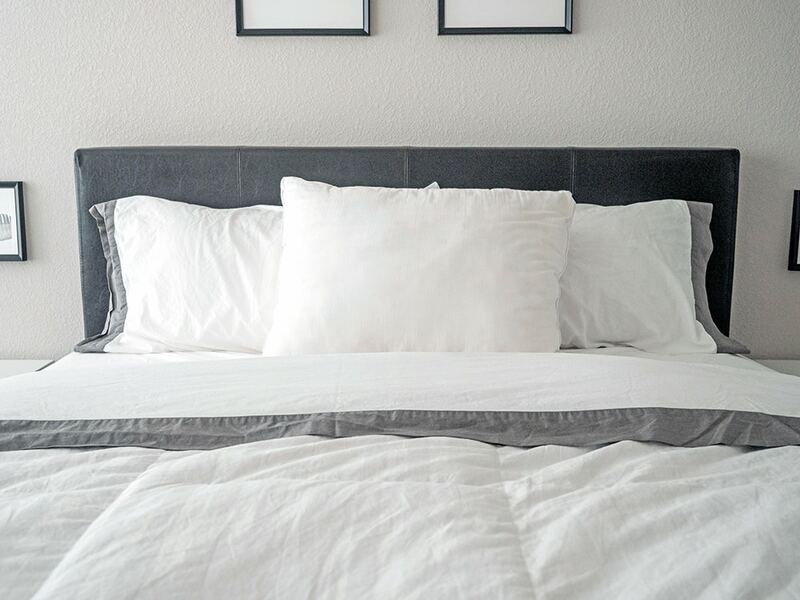 It’s comparable to a down pillow in terms of softness and those with allergies will benefit from the hypoallergenic nature of the polyester fibers. The 100% cotton outer cover fabric gives the pillow a crisp and clean feeling – the bright white color doesn’t hurt either. The care for the pillow is also simple and easy. 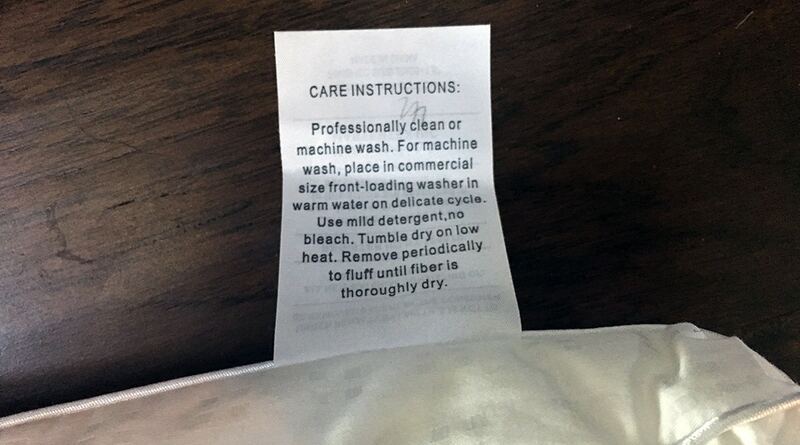 Either send it off to be professionally cleaned or wash it on a gentle cold cycle with some other delicates to balance the load and then throw it in the dryer for a low tumble dry. The makers of the pillow recommend stopping to fluff the fibers in the pillow during the dry cycle, but when I went to check on my pillow it was already fully dry and didn’t need to be fluffed (it will depend on your dryer). The pillow emerged from the dryer feeling evenly distributed and similar to how it came directly out of the packaging. Because the pillow comes fully expanded – as opposed to vacuum sealed – you can get an immediate idea of its firmness level. This down alternative pillow does not feel overstuffed and so the firmness is quite low, you can push your hand all the way down on this pillow pretty easily (please see photo below). I am primarily a back and side sleeper so I typically prefer pillows that have a little more firmness to them and often find myself stacking two down pillows on top of each other. With all that said, this down alternative pillow surprised me in how it supported my neck and head overnight. The product is said to be firm but your head will 100% sink into this pillow. Side sleepers may find that the cover fabric rises up next to their face as they sink in. For me, there was still enough filling to provide comfortable support overnight. I did not wake up with any aches or pains that indicated bad neck or spinal alignment. In the morning there was definitely an indent left from my head and neck where the polyester filling had been flattened. Those who like the firmness found in memory foam or shredded memory foam pillows may not like the lack of supportive filling in this pillow. However, those who sleep on their stomachs or prefer down pillows may enjoy the level of support they get from the fibers in this down alternative option. In addition to doing my own testing and review, I read a lot of other customer reviews on this pillow. It does seem that there may be more than one pillow being sold under this name, as several customers said theirs arrived vacuum sealed and with a different fabric detailing than the one I received and described. I would make sure to double check the retailer before making a purchase. I got my pillow on Amazon from Right Choice Bedding and fulfilled by Amazon. It did not come vacuum sealed. Based on my experience, I think this pillow is the best fit for stomach sleepers (or even back sleepers) who enjoy the feeling of a down pillow but want a little bit more firmness and even distribution. Side sleepers may feel that they sink too far into the pillow and may need a denser filling option. Those who tend to like medium firm or super firm pillows may feel like they need more than one of these pillows. If that’s the case, I would recommend an adjustable shredded memory foam pillow like the Coop Home Goods or the Snuggle-Pedic pillow. Lastly, be prepared to fluff the down alternative pillow in the dryer on occasion, as continuous use may flatten some of the fibers.